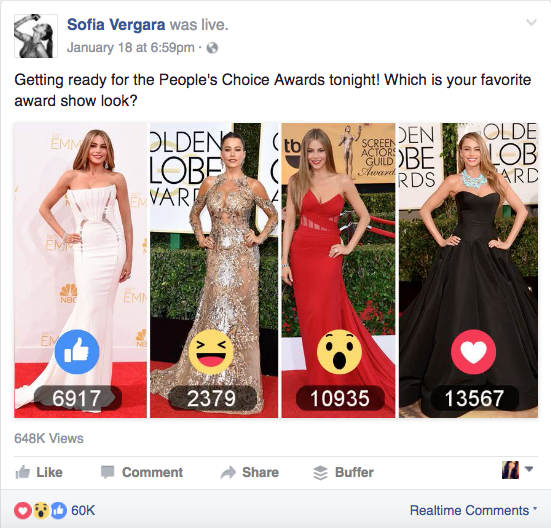 Facebook Reactions a Year on - How are Reactions Being Used and What Does That Tell Us? It's been a year since Facebook rolled out their 'Reactions' post response options, which came after Facebook CEO Mark Zuckerberg hinted that a version of the much requested 'dislike' option would be coming soon for The Social Network. And while Reactions don't include a 'dislike' option as such, they do add to the user capacity to respond to posts, and respond quickly - which is important when some 90% of your audience is accessing your platform via mobile. So how have users adapted to using Reactions as a post response tool? To mark their anniversary, Facebook's released new data on Reactions use, noting that Reactions have been used 300 billion times in total since launch. That sounds like a lot, but for context, Facebook reportedly generates around 4 million Likes per minute. As such, Reactions are only contributing a very small amount of overall user response activity. But even with their low usage rate, Facebook says that Reactions are a strong indicator of interest, and will be now be weighted more heavily by the News Feed. "Over the past year we've found that if people leave a Reaction on a post, it's an even stronger signal that they'd want to see that type of post than if they left a Like on the post, so we are updating News Feed to weigh reactions a little more than Likes when taking into account how relevant the story is to each person." So Reactions are more powerful than Likes - but strangely, Facebook also says that all Reactions will be weighted the same. That means that whether you select 'Sad' or 'Angry' or 'Love' on a post, they'll all send a signal to Facebook that you want to see more of that type of content. It makes sense in that if you've actually gone to the effort to use a Reaction you must have felt strongly enough about the topic, but still, it seems like they could have used the specific Reaction data as more indicative individual measures. Or maybe there's not enough use of each to generate strong enough signals to point to subsequent user intent and interest. Also, it could mean we see a heap more of these poll type posts in the near future. 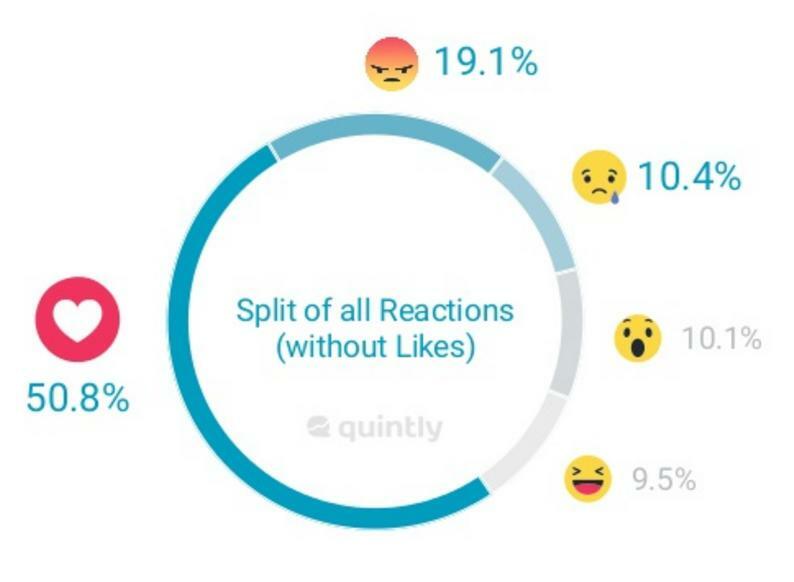 In terms of specific use, Facebook says the 'Love' Reaction has been the most used, accounting for more than half of total Reactions - which is both somewhat surprising and kind of expected. It's surprising in that people had been calling for a 'dislike' option for so long that you'd expect some of the more negative responses would see more use - I mean, really, the 'Love' heart isn't a heap different, in terms of response, to the traditional Like. But at the same time, the 'Heart' emoji has always been popular - a study by Quintly last May showed that the 'Love' Reaction was already the most used on Facebook by far at that stage. It's popular on other platforms too - Twitter, for example, changed their Favorite 'Star' to a heart partly in response to the rising use of the use of the heart emoji on their platform, and even checking emojitracker right now you can see that the heart is the second most used emoji on Twitter of all-time. But it does seem like a bit of a waste. As noted, people wanted a negative response option, and while Facebook hasn't provided an actual 'dislike' button, the hope of Reactions was that it would give people more ways to express themselves more easily, which would in-turn provide Facebook (and marketers) with more data. In fact, that's what we speculated would happen on launch - that eventually, Reactions data could provide a whole new range of emotional insights and tools which would enable better content targeting and creation. We'd be able to learn, for example, how posts that inspired the 'Sad' Reaction resulted in subsequent click-throughs, versus 'Haha' or 'Wow'. And with the adoption of Reactions being so low overall, they haven't really been able to deliver any significant insights. It seems that most people just want to be able to respond with a quick tap - maybe if Reactions were on screen all the time, as opposed to coming up when you hover over the 'Thumbs up' icon, that could increase their use. 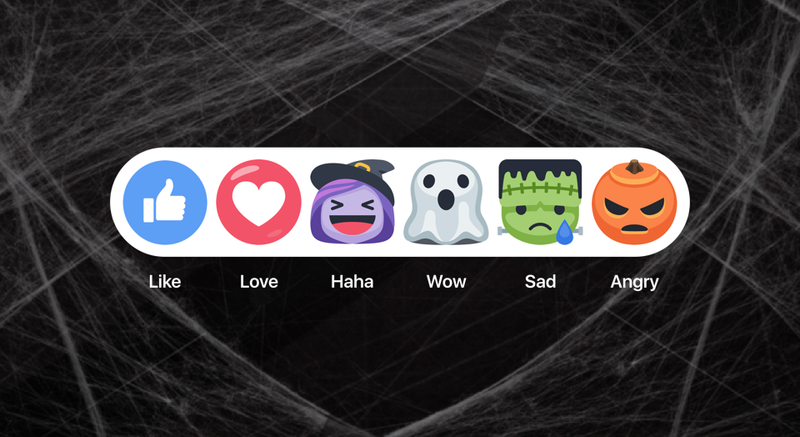 It's been an interesting experiment for Facebook - beyond the basic Reactions themselves, Facebook has also tried out themed Reactions like Star Trek, Mother's Day and Halloween variations. And while they've only been used this way a few times, that could provide another opportunity for Reactions, Facebook could either use them as a high-end ad option (movie tie-ins would make perfect sense) or look to implement similar themed responses as a means to boost reactions awareness and use. But at present, Reactions seem to be a small addition, a minor add-on in the wider Facebook experience. Will they ever become something more? As noted, Facebook could look to change their implementation in order to boost awareness and use. But maybe they're not seeing the data and use potential they once were - maybe adding in an option close enough to a 'dislike' button has been enough to quell user requests for an actual 'dislike' tool. Either way, at present, going on these numbers, Reactions are not a significant element. They can be used as an indicator to some degree (and individual results will vary), but their low adoption rate limits their value as a real insights tool.